Obama will spend Friday morning at a San Jose hotel talking about Obamacare. President Obama touched down in Air Force One at Moffett Field Thursday, marking the second time the leader of the free world has visited the Bay Area in as many months. He trotted down the plane's stairs at 5:56 p.m. and greeted about 50 people invited to the landing, including Sunnyvale Mayor Tony Spitaleri, Ames Research director Peter Worden, California National Guard Col. Steven Butow and Mountain View Mayor John Inks. 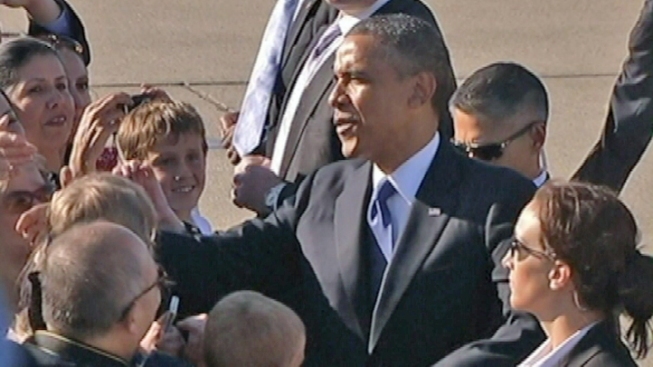 After shaking Obama's hand, Inks said, "He told me how much he likes Mountain View. He says when his term is over he's going to be enjoying California more." "He looks very, very good for having a tough job. His face is bright. That is a job that wears on you," Inks said. Prior to heading to a scheduled fundraising event in Palo Alto, Mr. Obama took a few minutes to greet some of the public that were waiting at Moffett Field. While the president doesn't need the money for his own campaign, his fundraising efforts in affluent Silicon Valley will go to help the Democratic Party. Obama's visit, which will last less than 12 hours, began at the home of Flipboard CEO Mike McCue and his wife, Marci, in Palo Alto for an early evening reception. Guests, who paid anywhere from $2,500 to $12,000 to attend the event, began lining up around 5 p.m. to get into the McCue's residence. Marci McCue, who spoke outside of her home Thursday morning, admitted that she was both nervous and excited to host the president of the United States at her charming, seven-bedroom, multi-million, pale yellow home, fully decked out with red-white-and-blue banners. Protesters, angry about Obama's support for the Keystone pipeline project, also greeted him on street corners. The project is an oil pipeline that will stretch from Canada to the Gulf of Mexico. After Obama left the McCues, he headed to the Portola Valley residence of Sun Microsystems co-founder Vinod Khosla and his wife, Neera, for a $32,000 dinner, complete with Greek salad, Fulton Valley chicken and hand-craft chai chocolate creameux cups. In Portola Valley, political signs were left on the side of the road for the president to see. One sign read "Reinstate Glass Steagall." Others featured the message: Take money out of politics. People who lined up the street in Portola Valley waved welcome signs when the president passed by. Lauren Work brought her daught to see the president drive by. "I've never seen a president so why not be part of history," she said. The president left the Portola Valley event at 9:01 p.m. and arrived about a half-hour later at the Fairmont Hotel in downtown San Jose. In addition to the fundraising, Obama's visit will be marked by a more unusual occurrence -- a speech. He'll spend Friday morning at a San Jose hotel talking about "Obamacare." He's expected to tout benefits of his Affordable Care Act by showing how it has created quality, affordable choices for Californians who plan to buy insurance this fall. California is the largest state with the biggest insurance market in the country, with nearly six million uninsured. An NBC/Wall Street Journal poll released Thursday shows that 49 percent of Americans think the signature health care reform law is a bad idea. After his Friday morning talk, Obama will head to Los Angeles for a Democratic National Committee fundraiser. Obama was in the Bay Area as recently as April for fundraisers in San Francisco. A livestream of Obama's speech will be available Friday morning on NBCBayArea.com. Bay City News and NBC Bay Area's Bob Redell, George Kiriyama, Stephanie Chuang, Kristofer Noceda and Jean Elle contributed to this report.